Your chicks are on order and the brooder tub is all set up and ready for them. Now you just need a place to put them when the chicks are mature enough to move outdoors. 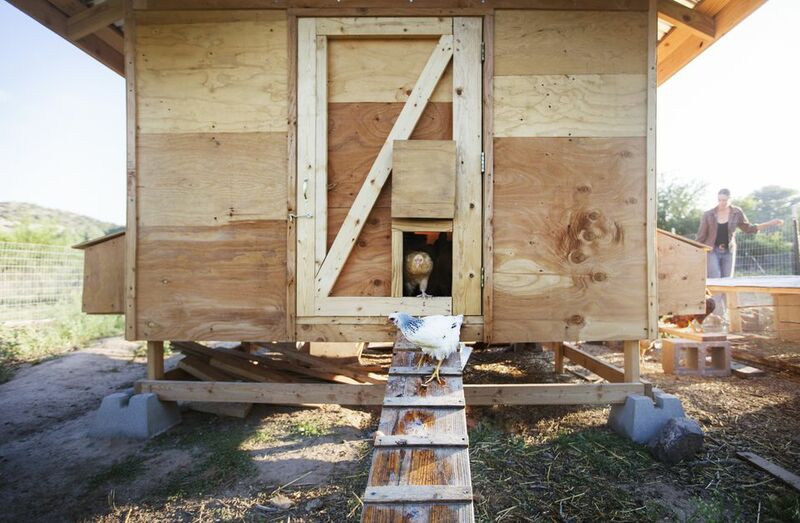 You will need a chicken coop, a henhouse, a chicken tractor—but which one? And how big should it be? Can you convert an old shed or doghouse to a chicken coop? Planning the right chicken coop begins with considering and answering a number of key questions. Do You Need a Moveable Tractor or a Stationary Coop? The type of coop you choose depends on whether the chickens will live full-time in it, with access to an outside run or larger portions of pasture; or if it needs to be a movable coop that can be relocated frequently to provide fresh ground for the chickens to forage. Before any further planning is done, decide if your coop will be a permanent, stationary structure, or if you will need a moveable "chicken tractor" you can shift around at will. How Big Should Your Coop Be? Next, figure out the amount of space required for the number of chickens you plan to keep. Be on guard against underestimating—you may be starting small but quickly decide to expand to a larger flock. Many people find it best to build on the large side, which allows you to expand your flock later on. If your birds have access to outdoor foraging, allow 2 to 3 square feet per bird inside the coop. Of course, more space is better, so don't be afraid to make your coop more spacious if you have the room. If your birds must remain cooped constantly or for a portion of the year (such as through winter) aim for 5 to 10 square feet per chicken. If your birds will live in a chicken tractor that moves with them, 5 square feet per chicken is about right. These are just general guidelines. The bigger the chicken, the more space it needs; meat birds, in general, require more space than laying hens, and full-grown pullets need more space than baby chicks. Many behavioral problems with chickens, such as pecking and aggressiveness, can be cured with more space, so plan for a coop that is as generous in size as your space and budget allow. Which Features Does Your Coop Need? Chicken coops can vary from a very simple floorless wooden box surrounded by chicken wire and covered by a piece of plywood roof, to elaborate "designer" structures costing thousands of dollars. There are so many options that choosing can seem overwhelming. If you're in an urban or suburban setting, you may need to consider both security and aesthetics as well as local building codes, zoning ordinances, or HOA (homeowner's association) restrictions. Some neighborhood associations create their own CC&Rs (covenants, conditions, and restrictions) that you agreed to follow when you moved in. These CC&Rs often are more restrictive than the overall community's building codes and zoning ordinances, but you have no choice but to comply with them. Restrictions regarding chickens and other livestock can be particularly rigid, so make sure to check first to avoid later disappointment. Nest boxes. Plant for one nest box or one square foot of community nesting space for each 4 to 5 hens. You might think this is being stingy when it comes to nest boxes, but with too many nests, hens can be "broody" and sit constantly on the nest in an effort to hatch eggs. Position the nest boxes at least 2 feet off the ground and contruct them about 1 foot square. Milk crates or plastic tubs lined with shavings or straw make fine nest boxes; just attach them to a shelf or directly to the wall. Roosts. Most laying chickens like to roost. A good rule of thumb is 6 to 10 inches of roosting space per bird. Roosts should be at least 2 feet off the ground. Roosts can be as simple as a ladder fastened to the wall at an angle, or sturdy twigs attached to the walls of the coop. Ventilation, so that gases from birds' respiration and excrement don't build up inside the coop. Shade. Chickens love the shade, so a coop and run should include shady spots. Dust baths. Provide areas of dry soil or dirt where hens can dust bathe, which can help control parasites. This can be as simple as a box filled with dirt or sand if there isn't a spot on the floor of the coop. Hens with access to outdoors will easily find places for their dust baths. For winter, most hens need only a clean spot somewhere in the coop, usually in a corner. Predator protection. Make sure to guard against entry from any unwanted animals, from wandering dogs and cats to weasels and foxes. Should You Reuse, Build, or Buy? Do you have a doghouse or shed that can be repurposed into a coop? Don't build a new structure if you don't have to. If you're not a builder, you can search Craigslist or other online sources for potential coop structures that are small enough to be moved to your property. Adding a new coat of paint, adding some windows or ventilation holes covered with chicken wire, and installing some nest boxes and roosts—you're quickly in business. If you can't find an already-built structure to repurpose, consider whether you want to build a coop yourself or buy one premade. For urban homesteaders and hobby farmers with small flocks and aesthetic considerations, buying a premade coop might make sense. For small farmers with a few dozen hens, building a coop is probably a more economical choice. Whether repurposing, buying a premade coop, or building your own, the floor system needs to be carefully considered. A wood floor can rot if you use the deep litter method, so if you go this route, plan for more frequent clean-outs. If you go without a floor, the deep-litter method can be used with the coop on bare earth or on a concrete slab.